I checked in at Abowlfulloflemons to see how far behind I am in the challenges, and I was pleased to see that the last couple are ones that I already have done. I did my spice cupboard a couple years ago, and it's still organized. Wanna know my secret? It's this funny little gadget , which Jarrod's grandmother was selling at a garage sale. I wouldn't have even known what it was. You just lay it inside a drawer (this one is for a drawer 19" wide) and then line all your spices up on it. You could get crazy and alphabetize them, but I find just being able to see all the labels at a glance is good enough for me. I have a general idea of where they're at, and it makes finding the right spice so easy. I would never go back to the cupboard system, it never worked for me. Since I had that task completed, I decided to do the cupboard above my microwave, where I keep bulk spices, oils, and vinegars. It's been about seven years since I decluttered that one. Guess what I found (besides a nasty layer of grease on the top of my microwave). Yep, two bottles of red wine vinegar (nearly full) and two full bottles of Lawry's. One wasn't even opened. Ack, I'm the stereotypical disorganized housewife who is buying things over and over because I forgot what I have! master closet... again. I seem to do this one constantly. Kira, you are really inspiring me with your organization! My pantry and laundry room look like sane people use them now - yay! One question: how deep is your spice drawer? 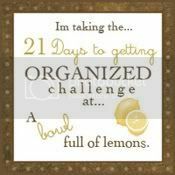 I'm wondering if mine will work with that organizer. Thanks! Sam, I'm so glad you're doing this along with me! It's difficult to get challenges done with kids underfoot, but I am *loving* being able to find stuff. Cooking this week has been so much easier since I organized the pantry. To answer your question, my drawer is 4" deep, and 19 1/4" wide. I was surprised by how much the organizer will actually hold. Every single one of my spices, except for the Costco-sized ones, are in there. That's great! I love it! I want one!